An obsessive, passionate creature looming in the darkness. That's how I saw Scorpio when I first drew her. In her right hand, she holds a cup filled with some dark potion, a poisonous brew no doubt, and you can see that I've added an ominous vapor emanating from the golden cup. That is some lethal drink. This woman means business. A couple of touches are inspired from her traditional animal, the Scorpion. One of these is a sharp hook, in lieu of pincers, that she uses to scrape at her enemies. Because you should know that Scorpios do remember everything and they will eventually get even whenever it matters. Another scorpion symbol, is a sharp set of blades that dangles from the braid in her auburn hair. It's a sort of weapon, a reminder that Scorpio can defend itself well. Actually her pendant is also a hook...or is it a crescent Moon? I like to think it's a Moon considering the Moon's influence on mood and that Scorpio is very emotional. But the hook/moon ambiguity highlights the fact that you never really know what Scorpios are feeling, or whether they are feeling it at all, so good are they at hiding their inner emotional turmoil. The galaxies were not in the picture when I drew this years ago. I added them because to me Scorpio is not all about dark forces and malefic will, that's an absurd stereotype. I think there's a spiritual force in Scorpio that transcends time and space and motivates the native to achieve and focus for years to arrive at their goal. Often this motivation is very intrinsic and does not depend on external rewards or material gain. I think for this reason, Scorpios can be truly spiritual in that they are moved by deep forces within. So I have her floating like a sort of celestial body removed from all material attachments. Strangely, no phallic symbol for this one. 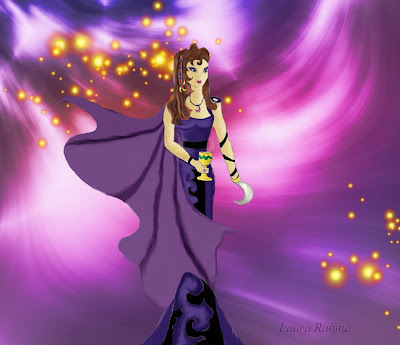 I've noticed that my other Zodiac girls are sporting swords, orbs, horns and other longish, tubular objects. I don't know why I omitted sexuality symbols in my Scorpio characterisation. After all, isn't Scorpio also about sexual energy? To compensate, I used a lot of black and purples because these colors have been associated with deviancy, the underworld and sexuality. Very appropriate don't you think?